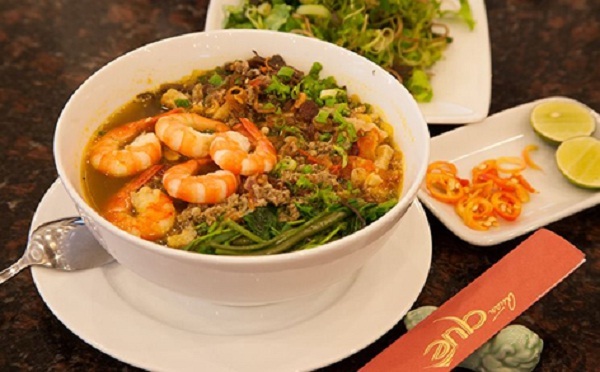 “Banh da cua’’ in Haiphong is a crab noodle soup from the Northern port city of Haiphong. 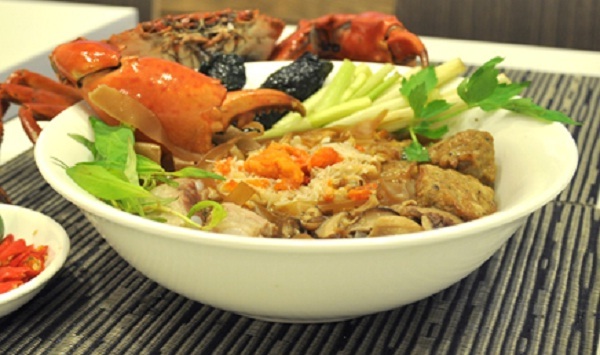 Crab noodles are famous delicacies typical of Haiphong lands. With the sweetness of the crab and bone broth, great fried fish, fried aromatic leaves guise of creating a difference of this dish. 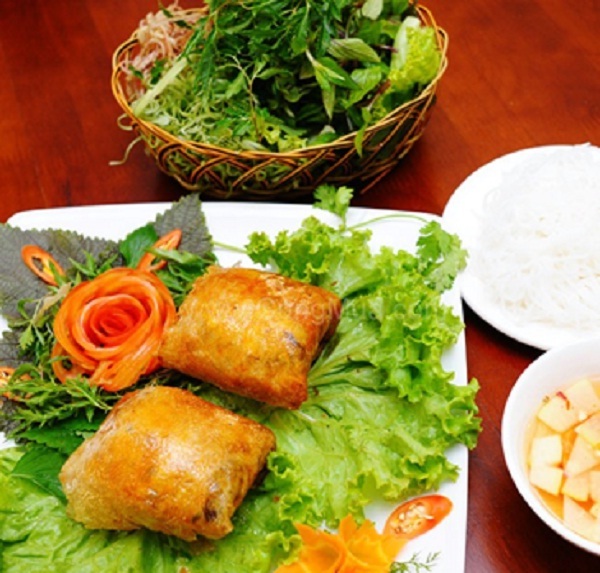 The soup also includes pork balls, two different type of crab noodles, pounded-up rice paddy crab and covered beef leaves, beef wrapped in betel leaves. And there’s lots of greenery in this version of the soup. As well as the plate of shredded lettuce and green perilla leaves that’s served alongside the soup, the bowl is stuffed with spinach. Crushed dried shrimp peeled away the pot to add fresh water. If you want broth flavor, they will put into it a few wing mushrooms. Red cake soaked in cold water fish out of bamboo basket to drain. 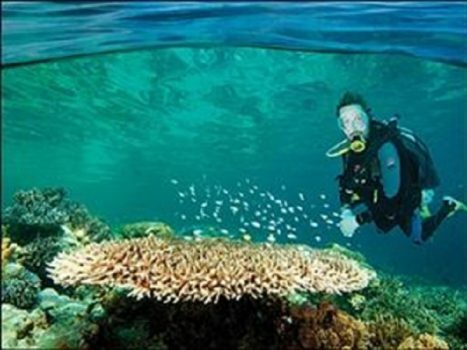 When diners are tufted through the same price, pour into the bowl, loading onions, fried fish, crab broth and served hot. The first impression on bowl crab noodles is colorful tanks or mass varies with accompanying materials like copper crab noodles, but simply with little pink crab meat, broth clear visibility of the stalks noodles slender. The broth has a taste of aromatic, tasty, sweet, while enjoying the delicious dish at the local or other areas are not. 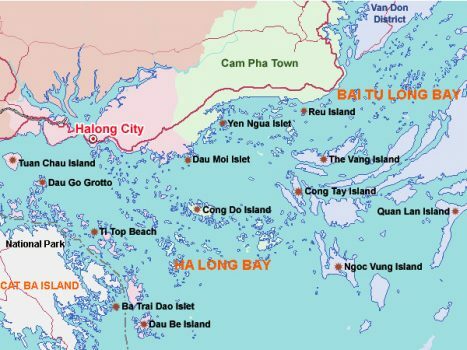 Gourmets say it “just going to Haiphong, enjoy crab noodles there to understand why this is a specialty dish”. You will stop enjoying the pancake bar thread bar, fresh crab meat sweet, chewy crunchy fresh vegetables. The combination “quay” and broth will make sweet flavor, greasy unforgettable tastes. Second item in the shop, the square block crab rolls, crispy, are accenting with beautiful blue bowl of vegetables and sauce crackers. Because of fried foods should taste and aroma of the crab is not intact like the crab noodles. 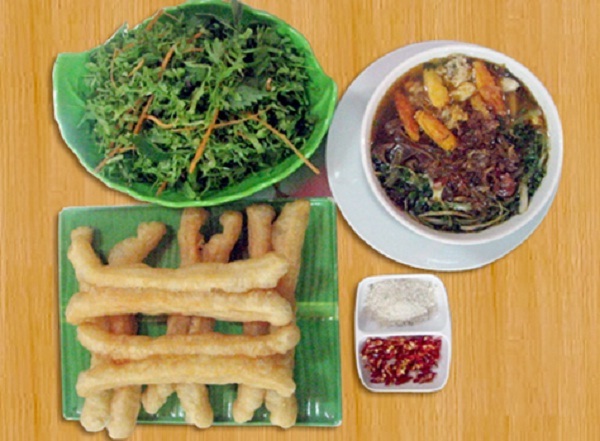 During the cool day, a hot bowl of noodle, spicy, flavor in Haiphong will make you feel comfortable.